I pretty quickly received a response to my post about the Cain-Gingrich debate, asking what I thought of the new woman who actually spoke out with her allegation today. 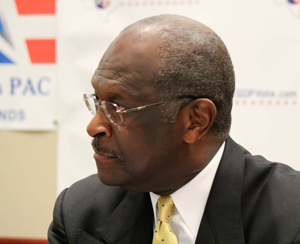 Of course, if she’s proven truthful, Cain’s done. But all day, there was nothing to corroborate the story. This was essentially my response. I have for many years, listened to the thoughtful Dennis Prager and Michael Medved, rather than the choir-preaching barking and screaming conservative talkers. Though Medved is best versed in both general and political history and has a sound understanding about how markets work productively and government corrupts them and should do so only so much as is absolutely necessary, Prager is my favorite because he approaches matters on the basis of moral principles, as I hope I do. I agree 100% with his maxims, “I prefer clarity to agreement,” and “I judge people by their moral actions more than their opinions (not necessarily for leaders, BTW). But Medved has increasingly worn on me because as what he perceives as his pragmatic political calculations, which I believe are passing and anachronistic. And regarding today’s accuser who DID speak, Medved’s discussion today has driven me to distraction and may have lost me as a listener, which I never would have said, even yesterday. Though it’s not the first time he’s been dismissive of Cain or predicted his doom before any such reflection in the public, today he leaned heavily toward questioning Cain on the basis of this report by a woman ushered to the fore by…GLORIA ALLRED??!! Gloria Allred is the epitome of a lawyer joke, which Medved essentially admitted. But he sounded like such a liberal when he stressed “how serious these accusations are.” If I’m wrong, the facts will prove it, but I think the woman has been offered something of value by forces aligned with Allred and the left. But as for Medved, he’s too smart to submit to that crap. And it’s horrid to accede to raising questions about a man’s character, BEFORE the facts are made clear. And Medved has joined the chorus of establishment conservatives who have challenged Cain that he ought to “get the facts OUT.” But, he never asks the critical question: What if there ARE no facts? And he doesn’t acknowledge that The National Restaurant Association has affirmed what Cain said from the start; that Cain was neither part of or privy to the agreement reached with the woman. So I ask myself, “Why would a good and smart man of genuine conservative convictions do that? I had to speculate and his discussion of the next hour affirmed my speculation: he thinks Romney can WIN. And he isn’t alone in that, though I think A) they are all mistaken about that, notwithstanding the suggestion of polls A YEAR OUT, which is imprudent to so lustily embrace, and B) I think the crisis is so great today that Romney’s calculated posture and tentative intent is incapable of leading America out of it. If some likely calamity ensues, Republicans will catch the blame for it, which is the story of my life. It’s the story of these erstwhile wise men’s lives too, but the pragmatic residue of the decades-long Republican minority and media monolith that formed these men’s calculations, are etched in their political bowels. So fine: if you really believe there is some meager form of political salvation for Republicans in this posture of Romney promotion (again, I don’t), preach it. But to accede to the raising of questions about a heretofore decent and innocent man’s character, is for me a bridge too far. I hope Dennis Prager would recoil from that.